This customers' most favorite trip takes you to enjoy the best (Shanghai), most beautiful (Great Wall), the oldest (Terra Cotta Warriors) and the newest (Three Gorges Dam) in China. Upon arrival at Beijing airport, you will be met by our English speaking tour guide and transferred to hotel. Leisure on your own for the rest of the day. As the center of politics, cultural and international exchange, Beijing is a modern metropolis full of vitality. 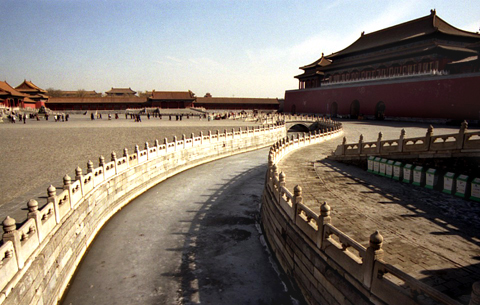 For the history buffs, Beijing is a living museum, but it has something to offer everyone. It is also the starting point for most of our China vacations. [ Optional ] Lao She Tea House: Lao She Tea House is one of Beijing's most famous tea house, and has been visited by a number of well-known politicians. It is a wonderful entertainment house with short shows by comedians, singers, musicians, acrobats and opera performers. Sightseeing tour with a private car with driver and a English speaking tour guide. Visit all must-see attractions in Downtown Beijing. At night, watch the famous Peking Opera, it is a kind of combination of arcobats, traditional singing and dancing performance. As the largest city plaza in the world, it is of great cultural significance for its seeing of several key events in Chinese history. Today here are always sightseers and kite-flyers. Most visit at dawn or dusk to see the flag raising and lowering conducted by the PLA. With a history of 160 years, Peking Opera, extolled as “Oriental Opera”, is representative of all operas in China. Full of Chinese cultural traditions and tidbits, the opera presents the audience with touching stories, beautiful paintings, exquisite costumes, graceful gestures and martial arts. The Summer Palace deserves your visit to her exquisite buildings, long corridor, and beautiful bridges. Her shoreline pathway makes an excellent run or walk for you. It was a luxurious imperial garden for royal families to rest and entertain in Chinese Qing Dynasty. For almost 500 years, the Forbidden City served as the home of 24 Emperors and their households, and the ceremonial and political center of the Chinese imperial government. It was listed by UNESCO as a World Cultural Heritage Site in 1987. [ Optional ] Dayali Restaurant: More than 40 chain restaurants under the same trademark of Dayali has been opened in Beijing area, served Peking duck and other local dishes, customers are mostly local Beijingers. Foods are good and price are reasonable. The highlight today is the Great Wall. The Mutianyu Great Wall is less crowded than Badaling, you might walk up and down the Wall on foot, or take cable car one way or round trips. The extra cost of cable car (RMB 50 one way) will be at your own cost. It was originally built to lead to Changling Tomb as a symbol of the passed emperor’s journey to heaven in their afterlife. Alongside the Sacred Road are 12 pairs of animal marble figures such as lions, elephants and 6 pairs human marbles such as generals and public officials. Changling Tomb is the largest and the most well-preserved one of the 13 Ming Tombs. Emperor Zhu Di, the third emperor of Ming Dynasty, and his Empress are co-buried in this grave. The 32 giant pillars in the Ling’en Hall, Changling’s main building, remain as solid as before after over 500 years. Mutianyu Great Wall seems to be not popular as section at Badaling, but it doesn’t get as crowded, which assist you in appreciating the magnificent scenery easily. Woods cover over 96% of the total scenic area, and its 2.5 kilometer stretch allows you a walk with striking landscape and fresh air. [ Optional ] Kungfu show: The splendid Kung Fu show, running daily in Red Theater of Beijing shows you an authentic Kung Fu on the spot, which combining story-telling, acrobatics to celebrate the philosophy and skill of martial airs. You enjoy the opportunity to contact performers directly after the show or to learn Kung Fu from them! Continue your city tour in Beijing. Transfer to airport for your flight to Xian.Be met at Xian airport by our English speaking tour guide and transferred to hotel. It was the place where the Emperor of the Ming and Qing dynasties would worship heaven and pray for good harvests. Built first in 1420, the Temple of Heaven is a precious example of China 's ancient architectural art and the largest design for worshipping heaven in the world. The Hutongs is the old narrow paths where common people used to live. 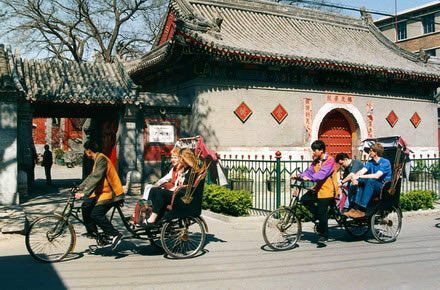 You will be taken by rickshaws to visit ordinary Beijing families living in these compound houses. Rickshaws are actually three wheeled bicycles. There are fleets of them circling around the Hutongs. [ Optional ] Dashilan old street: Dashilan is the oldest and perhaps one of Beijing’s most fascinating streets to explore. This district is cluttered South of Tian'anmen Square, it is the civilian area, known as the grassroots culture under the Forbidden City. 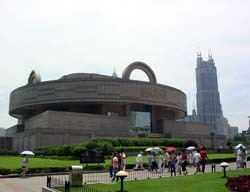 Visit the Terracotta Warriors and Horses Museum, Bell Tower and Big Wild Goose Pagoda. Built in 1384 A.D, the Bell Tower boasts a history of over 600 years. It is the largest and best-preserved of its kind in China. Visiting the Bell Tower, you can still see the Big Iron Bell which was made in Ming Dynasty, 2,500 kilograms in weight. It was built in 652 during the Tang Dynasty and currently boasts height of seven stories. It’s said that Master Xuan Zang built this pagoda to house the Buddhist scriptures and relics he had brought back from India. Terracotta Warriors is the underworld terracotta army of Emperor Qin Shihuang (the first unifier of China, 259BC-210BC). It’s reputed as the Eighth Miracle of the World. 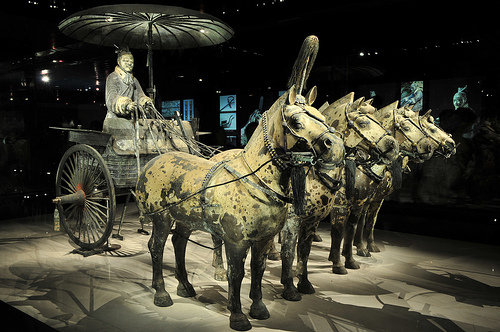 Now the Terracotta Museum consists of Pit 1, Pit 2, Pit 3 and Pit 4 as well as the Hall of the two bronze chariots and horses.